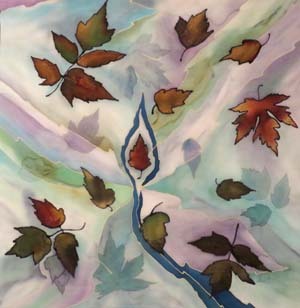 Leaves floating in a puddle inspired this silk painting by Phillippa Lack. You come to a puddle where a few autumn leaves float. You walk around it deliberately but barely thinking about it. You continue your walk immersed in your thoughts, the puddle forgotten. Unless, perhaps, you’re an artist. Fiber artist Phillippa Lack recreated her impression of such a puddle by painting leaves on two layers of silk, giving the illusion that some of the leaves lie below the surface of the water. From her back yard to Hubble telescope images, Phillippa finds inspiration everywhere for her silk art, often executed in three dimensions. Here are some of the secrets she shared with me for working with a medium where paint – even paint especially formulated to dye silk – flows where it will. To a silk painter, resist is a noun – a solvent that blocks dye from spreading. On the piece pictured above, Phillippa drew the outline of the leaves with resist to which she had added brown dye. When it was dry, she could fill in the rest of the leaf without the deep autumn colors bleeding. It sounds simple enough, but I’ve read that achieving consistently successful results with resist takes a lot of experience. Another way to protect an area from bleeding is to cover it with wax. Rozome (pronounced row-zoh´-me) is a centuries-old Japanese technique for using wax and dye on silk. 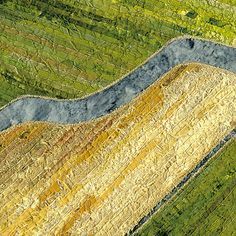 The landscape below appears to be quilted with several fabrics, but it’s actually one piece of silk. Phillippa used some of the principles of Rozome as well as machine- and hand-stitching to create it. This is a close-up of just part of the finished work Panorama so you can see the detail. 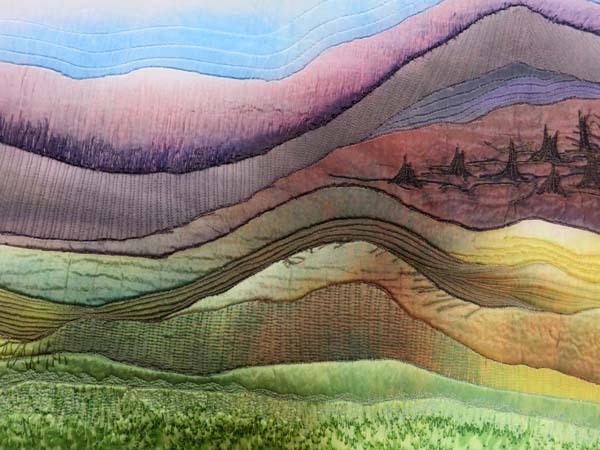 This section of Phillippa Lack’s silk painting “Panorama” shows detail and texture added with silk thread after painting using the Rozome process. Phillippa started at the bottom of the scene, applying color with a special brush for Rozome. When the area was dry, she covered it with wax. When the wax had hardened, she worked on the next area of color. When it had dried, she repeated the process. And so it went, up through the layers of color. 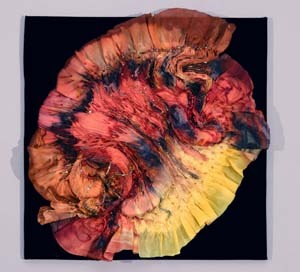 Next she covered her work in layers of paper and applied an iron to lift the wax from the silk onto the paper. Departing from traditional Rozome, she put the silk, wrapped in paper, in her steamer to set the dye. All remaining wax came off during this steaming. Phillippa could then add texture and design with thread. Phillippa Lack used salt to draw dye into dots of color on this silk scarf that she painted. 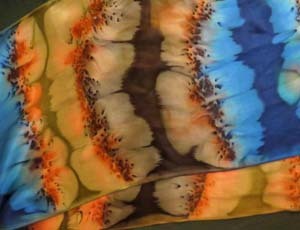 The easy flow of dye across silk can be used to advantage to create some special effects. After applying dye, Phillippa often sprinkles salt very lightly on an area to make the dye run. You can see the results on the silk scarf in the photo at left. Those dots weren’t painted on – they’re the result of sodium chloride drawing dye to it. The size of the dots and the degree of streaking from them depend on the size of the salt granules and the particular dye around them. It’s definitely chemistry at work. 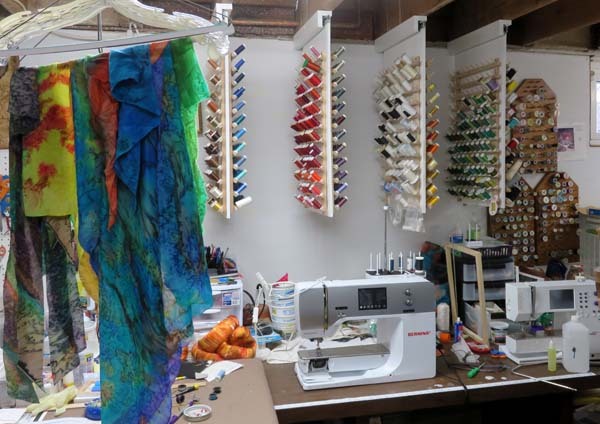 The soft drape of silk could be a challenge for an artist who needs a fabric that will hold its shape for three-dimensional work, including wall hangings. Phillippa met the challenge by investing in a small smocking machine – a set of rollers about a foot long with a row of needles that catch and crimp a piece of silk as it rolls through. 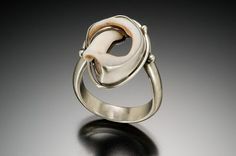 The result is a silk textile that she can bend and twist and that holds the shape she creates. 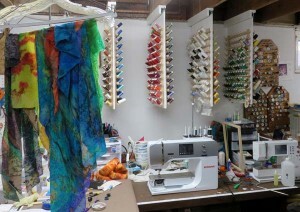 At left is her work Sunswirl, smocked in the center and boldly crossing the edge of its frame. 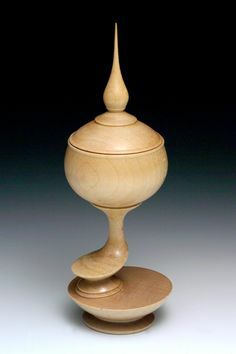 I first encountered Phillippa Lack’s work at the annual sale of the Handweavers Guild of Boulder in November. (The Guild welcomes all kinds of fiber artists.) Her use of extraordinarily rich colors enchanted me. I picked up her business card for PKL Designs and noticed the unusual letters MSP after her name. I learned that they stood for Master Silk Painter, an honor awarded by Silk Painters International for outstanding artistry and skill and now known as Distinguished Silk Artist. Painting silk is only part of Phillippa Lack’s art. 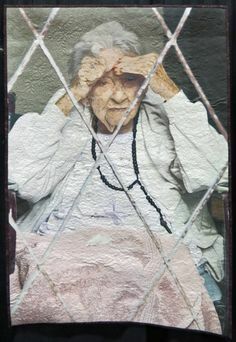 Stitching by machine and by hand adds decorative elements to many of her pieces. Wall art is her specialty, but she also makes wearable art. Phillippa credits her early life in Jamaica with her love of the rich colors that captivated me and drew me to visit her in Cheyenne. Her work Panorama and another landscape will appear in March at the Western Spirit show in Cheyenne’s Old West Museum. 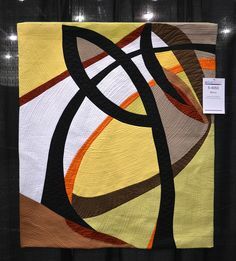 Phillippa is also an active artist along the Front Range, with memberships in Handweavers Guild of Boulder, Front Range Contemporary Quilters, and Artists Association of Northern Colorado. Her work often appears at shows and at the annual Handweavers Guild sale. 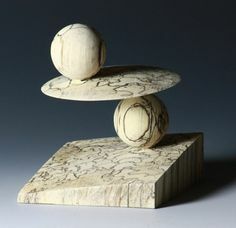 Follow Handmade on the Front Range on Facebook for updates on where her work will appear next. For now, you can view more of her work on her website, PKLDesigns.com. Be sure to click on the images to enlarge them – the detail is too good to miss. You can bring up all of her portfolio’s categories by hovering over “portfolio” in the menu. On her “about” page is a delightful photo of Phillippa in her wearable art, along with a glimpse of her life in her own words. What she doesn’t tell you is that she created her website herself and works for a small web development company in Cheyenne. Another fascinating secret shared! 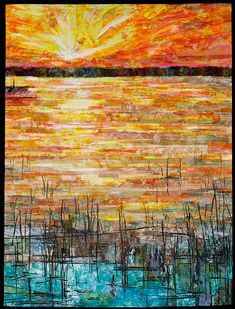 This entry was posted in Fabric & Fiber and tagged Phillippa Lack, silk painting on January 14, 2015 by Sally.